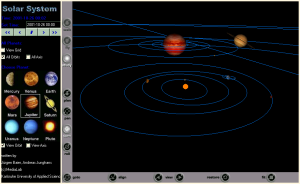 During our studies at the Karlsruhe University of Applied Sciences, Jürgen Baier and I created a 3D model of the solar system. The model itself is written in VRML; the control panel is a Java Applet. To view the model, you need a Java-enabled web browser and a VRML browser (e.g. Cortona). Please be patient while the applet is initializing - this may take a few seconds. A complete archive including source code can be found in the download section. The text field "Set Time" can be used to set the model time. The date format must be exactly the same as the one displayed above, e.g. "2001-10-23 00:00" (without quotes) for October 23rd, 2001, 00:00 hours. By pressing [Enter] the new date is set. If nothing happens, the date format entered is probably not quite correct. The buttons below the time display act like a video player. The animation can be set to forward, backward, fast forward, and fast backward. The button in the middle makes the model time pass in real time. The check boxes below "All planets" can be used to switch on and off the grid lines (on the plane of the ecliptic) and the orbits and axes of all planets. Via the planet images below, the virtual camera can be aimed at a specific planet. Finally, the check boxes "View Orbit" and "View Axis" show or hide the orbit and axis of the currently selected planet. The model is relatively accurate between about 1950 and 2050. Compared to the orbits, the planets are enlarged by a factor of 1000 and the sun by a factor of 10. The orbits of Jupiter's moons are not correct. Jupiter and Uranus don't have rings in the model. Depending on which web and VRML browsers are used, there may be problems with the link between the applet and the model.